Look below for up-to-date Edgewood homes for sale & Atlanta GA neighborhood! There’s an interesting dichotomy in Edgewood that will strike you the moment you see it: ‘Wow. 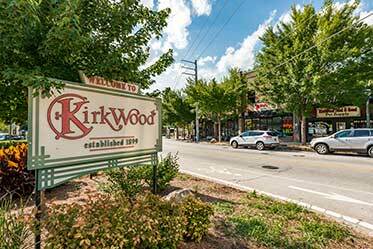 There’s a lot of shopping here.’ For more information regarding Edgewood properties for sale in Atlanta or to organize a private showing, contact your Edgewood real estate professionals today. Thinking about the purchase of a home in Edgewood? Contact The Keen Team, your local real estate agents, for comprehensive help in the real estate market near Edgewood, Atlanta. Call us at (404) 270-9374 today! History lives alongside new construction (and a massive shopping area) in this close-knit community. Edgewood, as a neighborhood, has been around for more than a century. But the Edgewood Retail District, for the past decade, has been the face this part of town has presented to the world. In addition to anchor stores like Target, Kroger, Lowes, Barnes and Noble, and Best Buy, this 44-acre development is also festooned with myriad restaurants and boutiques, which in turn are surrounded by a collection of modern condos, prized by residents for their convenience and centrality of location. But Edgewood doesn’t stop at its modern commercial endeavors. 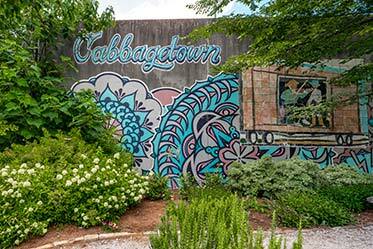 If Atlanta is good at anything, it’s yielding a new aesthetic at each turn, and this neighborhood lives up to the trend. Behind the scenes, quiet, winding back roads offer a variety as diverse as the area itself, where historic Craftsman-style homes blend seamlessly with a continuing wave of new developments that have been meticulously designed to carry the aesthetic into the 21st century. When it was built in the late 19th century, Edgewood was a pretty blue-collar place, populated mostly by workers at the factories that were booming at the time—something that’s reflected in the architecture. Craftsman-style homes, popular now for their simple, streamlined aesthetics, were more affordable and easier to build than the more complicated Victorian structures in the more established neighborhoods to the east. It’s for this reason that the latter structures are seldom seen in this part of Atlanta. Edgewood is located about three miles east of the center of Atlanta, a half-mile south of the Ponce Corridor. 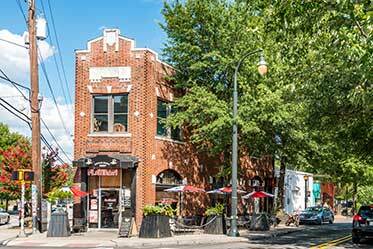 It is served by its own MARTA station, and because of the neighborhood’s extreme proximity to shopping, restaurants, and retail resources, it’s not too uncommon to find someone who lives, works, and plays in this part of town. Known mainly for its varied retail shopping options and urban location, Edgewood comes up a bit short in the parks department. Not far from the core of the neighborhood you'll find Coan Park on the border of Edgewood and Kirkwood and, if soccer is your thing, you'll love Arizona Ave Soccer Fields. While we’ve said before that owning a car makes life in Atlanta a whole lot easier, but thanks to a MARTA connection, as well as proximity to shopping and entertainment, this is a rare area where you might be able to do without—if you play your cards right. Don’t neglect the east side of the neighborhood. This part of town has some lovely public spaces, and a few quirky businesses that are totally worth the visit. Don’t confuse the neighborhood of Edgewood with the street of the same name. While there is a popular thoroughfare just a little to the west called Edgewood Avenue, that road doesn’t quite reach this part of town. Like many of the newly revitalized Intown neighborhoods in Atlanta, the quality of the public school system isn’t a priority. There are, however, a number of charter and private school options for residents to choose from. Here’s a complete list. Moreland Avenue runs along the westernmost side of Edgewood, and provides access to the Ponce Corridor slightly north (through Little Five Points). The other main surface road is Hosea L. Williams Drive, which runs east through Kirkwood and East Lake—charming areas on their own, but if you’re heading to Decatur for any reason, this road carries a little less traffic. Edgewood is located just north of I-20, and the onramp is just a few hundred feet down Moreland Avenue. The northern border of Edgewood is lined by an elevated MARTA track. While the gentle whine of the train can be heard by residents into the late evening hours, the ease of access to the Edgewood-Candler Park station (east-west) is worth it. Put your name on the list, grab some seeds, and raise your own crops in this quaint plot of land, specifically designated as a community garden for the neighborhood. It’s a great place to socialize and meet some neighbors, too. Part of Edgewood’s appeal is the fact that, despite its new-construction shimmer, it’s actually located within a 10-minutes’ walk to some of Atlanta’s most popular, most bucolic neighborhoods and eclectic hangout spots. To the north, Little Five Points; to the east, Kirkwood; and to the south, East Atlanta Village. Interested in buying a home in Edgewood? Give our Atlanta real estate experts the opportunity to guide you through the purchase of your next house or the sale of your current residence. As local real estate agents, we have insight on the dynamics unique to the Edgewood housing market. Connect with The Keen Team for information on representation for buyers and sellers in Edgewood. Considering the sale of your Atlanta property? Receive a Edgewood property value analysis with the help of our CMA page!